Like the original Lanyard, the Low-Profile Lanyard flash drive has a polyester lanyard that offers a huge print area. This wearable promotion piece holds your digital data and travels with your end user. The flash drive body clips into the lanyard when not in use. Order this custom flash drive in your brand color. Add your logo and your data. Put them in the hands of your end user and watch them advertise your brand for the duration of the conference, tradeshow, event or any occasion. 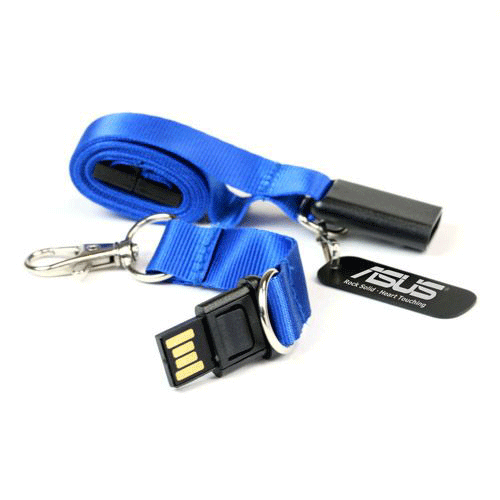 These Low-Profile Lanyard flash drives are a great way to make your flash drives stand out, with their lanyard design allowing users to easily travel with them. You can fit your entire logo on the large print area to promote your brand and make it highly visible every time the user sees it. Along with other flash drive designs we offer, these products are a unique means of combining personal use with visual appeal in your marketing materials. To purchase a bulk shipment of these Low-Profile Lanyard USB drives, simply request an instant free quote from us today, and we’ll work with you to create a unique product. We also provide other options to customize each order, including preloaded data, storage capacity, and color using stock or custom options through The Pantone Matching System. Regardless of which flash drive models you choose at Every USB, you’ll get top-quality products with every order. We also enable customers to professionally set up artwork using our Adobe Illustrator templates, which can help us understand exactly how you would like the finished product to appear. If you would like to get started on a shipment with us today, order from us online here and get started on designing your custom flash drives.